Yogurt gives quick bread and pancakes moisture and a slight tang so I often include it in baked goods. It's nice that your version isn't crazily sweet or oily but still appears pretty decadent. I think I'll make some chocolate muffins using your formula this weekend. Let me think... Hazelnuts and candied orange peel? :) I'll let you know how it turns out! In that case, would you use ground hazelnuts instead of almond meal as part of the flour substitution? You can dial down the sugar as much as you like. I did try it with just one tub of white sugar and found it not quite sweet enough for the add-ins (I think it was apple and chopped prunes). I didn't sub ground hazelnuts for part of the flour because they're a bit pricey and not readily available in supermarkets... 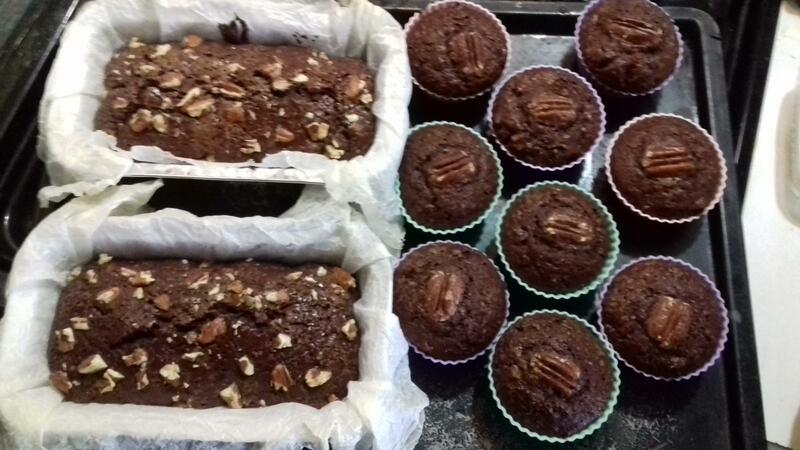 I scalded down the recipe by a quarter and made 3 regular muffins. The ratio was the same except that I put 1 egg instead of 1.3333....eggs :) For the flour, a quarter of it was unsweetened cocoa powder and the rest was Indian atta. I optioned for homemade ghee instead of oil. Since I put milk chocolate chunks and candied orange peels inside, we feel that they are sweet enough for our taste at 1/4 tub of sugar (which means 1 tub for 4 tubs of flour). 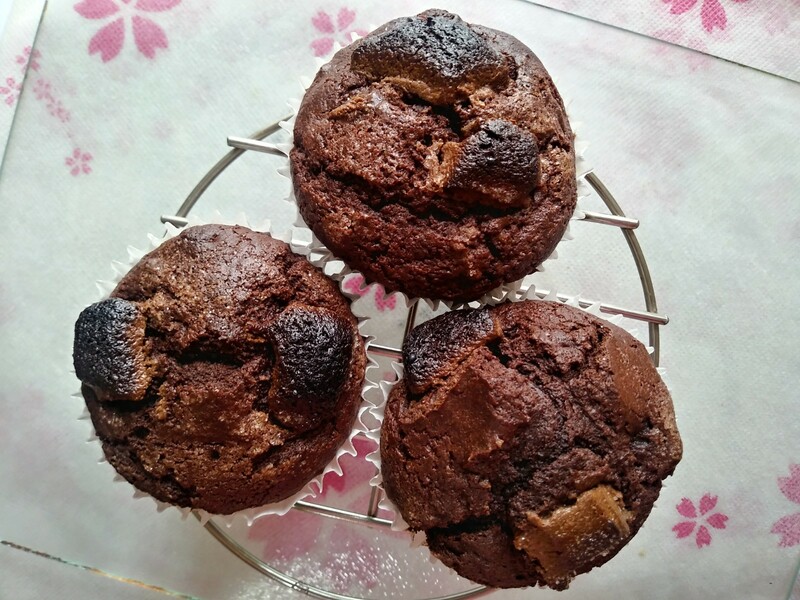 We like the texture: it's moist and slightly crumbly, just how muffins should be! Thanks again for the recipe! 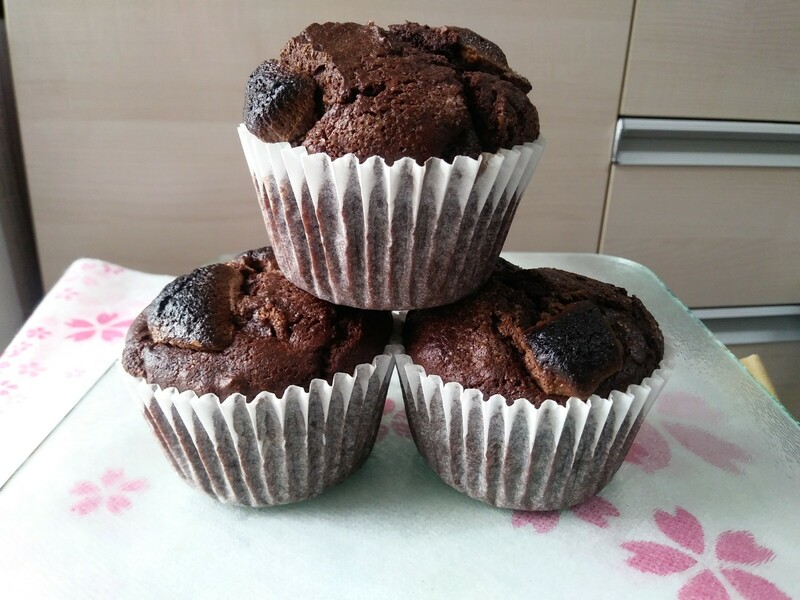 But if 3/4 of the recipe gave you only three muffins, those things must be huge! I made a batch over the weekend and got this! Not scaled down by "a quarter" but "three quarters"! So I divided everything by 4 and made 1/4 of the amount listed. There was also an error in the egg amount (should be 0.75 not 1.33 for the original ratio). Blame my carelessness... I hope this haven't caused too much confusion. Oh my. Well, just made another batch of Hamelman's 5 grain SD, so this will have to wait. My levain popped the lid of the container because I didn't put it in a large enough bowl, so instead of 12-16 hours, it was almost 9 hours. Will see how it comes out! Carole, I love your creations. But thanks anyway. I crib recipes from all over and then play "what if" with them, based on available time, ingredients, equipment and skill level. That's all! That Hamelman 5GL is a good one, isn't it? Can't wait to see it. I make it on a regular basis to take to my pottery group. 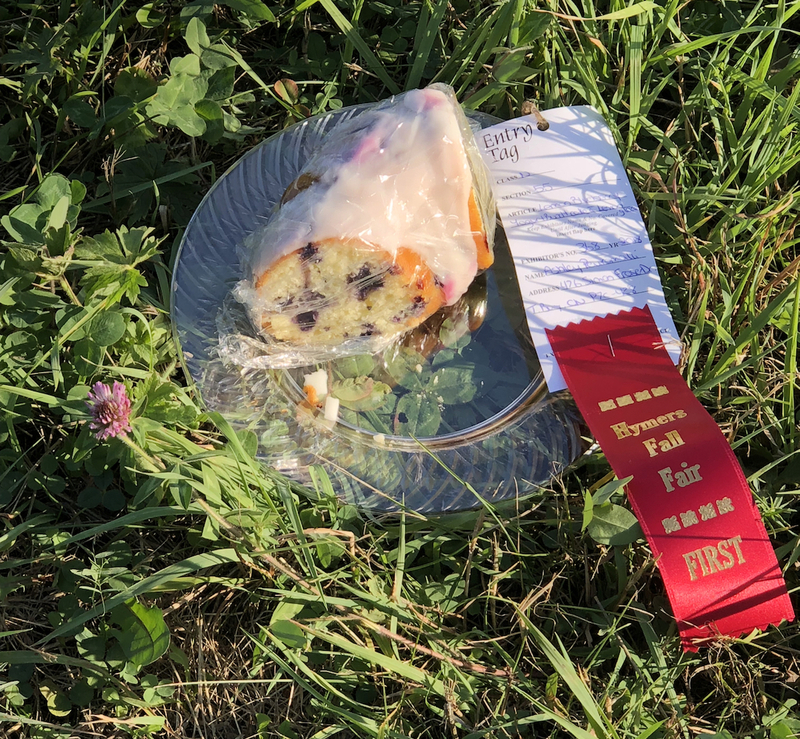 My daughter won a first ribbon with it when she made it for a fall fair. Here is our version. I don’t usually put the glaze on it but the fair rules stated it needed a glaze. I use a 2/3 cup measure instead of a large individual yogurt tub. Any yogurt will work. I’ve used thin plain yogurt or very thick Greek yogurt. And like Carole said, AP or bread flour will work. I have strong bakers flour in the house these days and that’s what I use. 3. Add the flour, baking powder, and zest, mixing to just combine. 4. Add the oil and stir to incorporate. At first, it will look like a horrible, oily mess, but keep stirring, and it will come together into a smooth batter. 5. Butter and flour a Bundt cake pan. Sprinkle some of the blueberries on the bottom of the pan. Pour and scrape part of the batter over the blueberries. Repeat sprinkling of blueberries and layering of the batter finishing with a layer of batter. 6. Bake for 50 minutes, until the cake feels springy to the touch and a toothpick or cake tester inserted into the center comes out clean. 7. Cool cake on a rack for about 20 minutes; then turn it out of the pan to cool completely. 1. In a large Pyrex measuring cup, combine the sugar, and lemon juice. 2. Add in the butter, then microwave on high for 45 seconds. 3. Take out the measuring cup and whisk until smooth, making sure there are no lumps. 4. Let it sit for a few minutes then pour it over the Bundt cake. One of my pottery friends suggested using orange zest and fresh/frozen cranberries. I am going to give that a shot next time I make it! It is an easy enough cake to make on the spur of the moment -- if you're out of starter you can just use all yogurt -- every once in awhile I take some cupcakes to my favorite vendors at market day. It's so simple to make people happy sometimes. I've done fresh cranberries in this, it works a treat. Like I said, you can throw anything at this batter and it's always a no-fail! and the 2/3 or so cup size. I’ve gone to a 2/3 cup size because it fills my bundt pan nicely and I find using a bundt pan more decorative when taking it out somewhere. The original recipe I used also called for a full tub of oil but I cut it back and it doesn’t seem to affect the cake at all. You have salt in yours where mine doesn’t. I’ll gave to try a pinch in it next time. Such an easy and delicious recipe. First time I saw it made was by my aunt in Cholet. in the past and never actually noticed the difference. However, with this much cocoa powder, I do add just a tiny pinch of cayenne pepper. It's great! And my add-ins go in by the handfuls, until it looks like the batter won't be able to support any more. I think I will make this for Easter! Thanks for the recipe! Looks like I might try this one! I love cake but because there's only me to eat it I rarely make it. Just wanted to say what lovely recipes all round and I might make some small cupcake versions. Just one question though… A recipe is done from the beginning to end with one tub then I can understand it makes no difference as to the size. But when part of the recipe is in tubs and the other in tsp or the like then it might make a difference. So what kind of size are we talking about when given in tubs? Can you give me an idea of one tub in flour, yoghurt and water in grams? Our yoghurt sizes do differ here. if the tub holds 1/2 a cup or 2/3 of a cup. The measured amounts in terms of teaspoons stay the same. Same thing with the eggs. I don’t increase any of those and it works out just fine. That’s the beauty of this recipe. You are right of course. Cakes like this are forgiving and that's their beauty. But seeing everything by weight gives me a better idea. But it just comes with a very large tub (or small bucket) and a strainer. So that's 125g of yoghurt. How does that compare to the same tub with flour? have one with the little jars. If we start with the premise that the 125g of yogurt is a half cup, and that a cup of flour weighs 130g, then you'd want around 65g per tub; the cocoa powder would probably weigh in the neighborhood of 40g? and sugar, about 100g per tub? I'm getting lost. 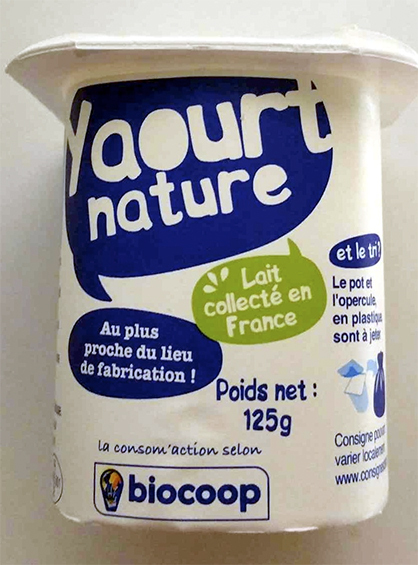 125g yoghurt, according to traditionaloven.com is 0.5 cups. Everything else falls into place. But I'll still try to remember to weigh things when next I bake. That's a pretty cool conversion site. Must remember to bookmark it. sometimes it's easier to google search (for example) "convert 1 cup of "x" into grams" and traditional oven comes up within the first few results and it takes you straight to the correct conversion page. Actually easier then going onto traditional oven to find the product you wish to convert. I've had my eye on it. Loads of great videos and every single one so well done. A lot of baking goodies too. I hope you get into it and post them here on TFL.